Recently I’ve been discussing how blogging will have a bit of a Renaissance soon as users move away from a centralized experience (social media sites like Twitter and Facebook) and back to a decentralized experience (like blogging). I believe blogging will become popular again as we look for ways to better gain control of the data we share and the content we create. Additionally, the functionality of blogs has continued to increase and improve. Ten years ago, blogs were little more than a writing area and one sidebar. Now, you can completely customize a blog’s layout and functionality so that the line between blog and high-end website is completely blurred. But one area where blogs have lagged a bit is in providing personalized content to each visitor. Every visitor is different and is looking for different content for different reasons. What blogging platforms and technology need to improve upon is taking visitor signals and translating that into intent and creating the content that the visitor expects. This can be done at a source level such as social media vs search, or based on search terms. Or it could change based on the landing page/post. This is already happening a bit, I’ve been tinkering with a couple of plugins that attempt to address the content customization issue. The first is Thrive Leads (affiliate link). It lets me control where my newsletter signup popup appears. For example, I wrote a few posts in 2012 on how to write and publish a book. These posts are very popular among aspiring authors, and I get a ton of search traffic to both of them. But most of the people that would read these posts are not the potential clients that I would want subscribing to my newsletter, so Leads lets me turn off the newsletter popup on those pages, so I won’t get subscribers from those posts. Another plugin I’ve been experimenting with is Clever Widgets (affiliate link). Clever Widgets allows you to customize the widgets that are displayed for every post or page. So if someone visits a particular sales page, you can customize the widget areas on that page to either complete the sale, or give more information about the product, or even include a live chat widget to attempt to close the sale. Or if someone visits your blog’s homepage where your latest posts are, you could serve up widgets that are designed to encourage them to become a subscriber, or view your most popular posts. As you can see, even these content personalization options are fairly limited, but it’s a start. Definitely check out the two plugins I’m using, but also give more thought to who your visitors are, and what content they are looking for when they visit your blog. For most bloggers, at least 50% of their traffic will be from search engines. People coming from search engines are looking for specific information, and if they don’t immediately find it on the post they land on, they will leave. Check your WordPress dashboard, if you use a plugin like Jetpack (affiliate link) you can see which search terms visitors are using to find your blog. This also gives you a better sense of what information they are looking for when they arrive on your blog. Besides focusing on visitors arriving via search, also consider that many visitors to your blog will arrive via a mobile device. This adds another layer of complexity as mobile users are far less ‘sticky’ and will quickly leave a site if they don’t get the information or experience they were expecting. It is imperative that your blog displays correctly on mobile devices including tablets and smartphones. For many publishers, mobile traffic has now reached a tipping point where it has passed desktop traffic, so you can no longer ignore mobile users. Make sure that your theme is responsive, and make a point to regularly load and navigate your blog on your smartphone. If you can’t figure out how to properly view and navigate your own blog on your smartphone, the odds are your visitors can’t either. 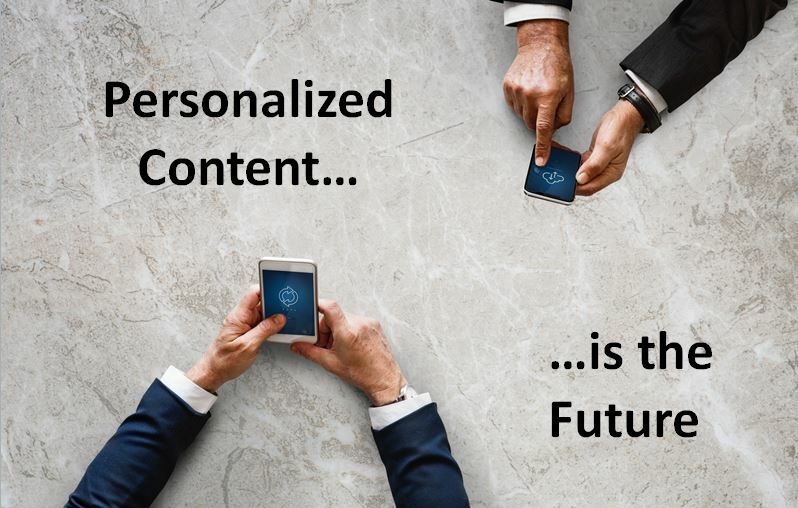 Soon, CMSs will seamlessly integrate machine learning to create personalized content experiences for visitors on the fly, which we can all use. Until that day arrives, think about what you can start doing now to give every visitor the content experience they are expecting.